The 4th Zhabdrung Rinpoche Jigme Norbu. 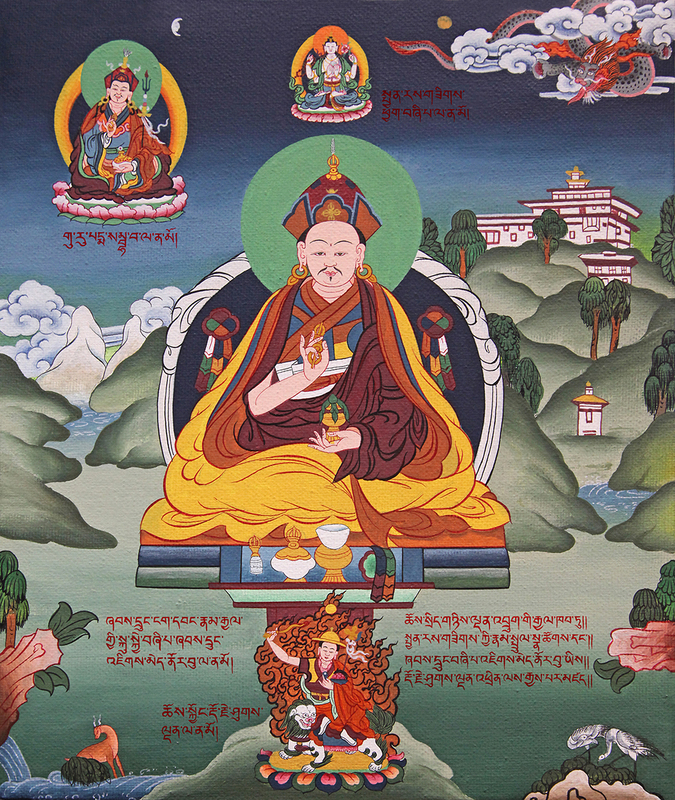 Above him is Chenrezig (the Zhabdrung line of incarnations are believed to be emanations of Chenrezig). To his right is Guru Rinpoche, one of the principal Drukpa Kagyu practices. Below him is Dorje Shugden, whose practice Jigme Norbu encouraged. To the right is one of the many dzongs (fortress monasteries) Bhutan is famous for. Meanwhile, Bhutan herself is represented by the all-powerful dragon in the clouds. It’s been four days (that’s right, FOUR) days since Rinpoche’s post on the 4th Zhabdrung Jigme Norbu’s connection to Dorje Shugden was published and at the time of writing, it has already exceeded 6,000 views. I know what y’all are thinking…Drukpa Kagyu? Dorje Shugden? What? But it’s all there. All the proof you need, published by the National Library of Bhutan who had the pechas (Tibetan-style texts) to prove that the Drukpa Kagyus of Bhutan propitiated, worshipped and invoked Dorje Shugden. They were encouraged by none other than Jigme Norbu, the 4th mind emanation (incarnation) of Ngawang Namgyal, who is the lama who founded the Bhutanese nation. Working on this post was an eye-opening experience, to say the least. I have always known Bhutan to be a Buddhist nation, to be a frontrunner in the environmental movement and to value happiness over the acquisition of wealth. But that was because those aspects of Bhutan had been elevated to pop culture; I never knew much about their actual history, about the circumstances that led to the formation of modern Bhutan and about the great deeds of their founding lama, Ngawang Namgyal. As we worked on the translation, all I could think about was what an amazing mind he must have had. To have strategised and actualised the subjugation of multiple warring fiefdoms so that they would unite under one name. To have conceptualised and implemented rules and codes to govern every aspect of a newly-united kingdom. To have crafted an entire culture so the people have something common to share between them, and therefore become united in more ways than one. To have built and encouraged Dharma practice, and ensured religious freedom for other faiths even though Drukpa Kagyu became the state-sponsored religion. Ngawang Namgyal was so renowned for this that visiting Jesuits remarked positively about his compassion and magnanimity. And to think, it was the mind emanation of this great being who encouraged the worship of Dorje Shugden. 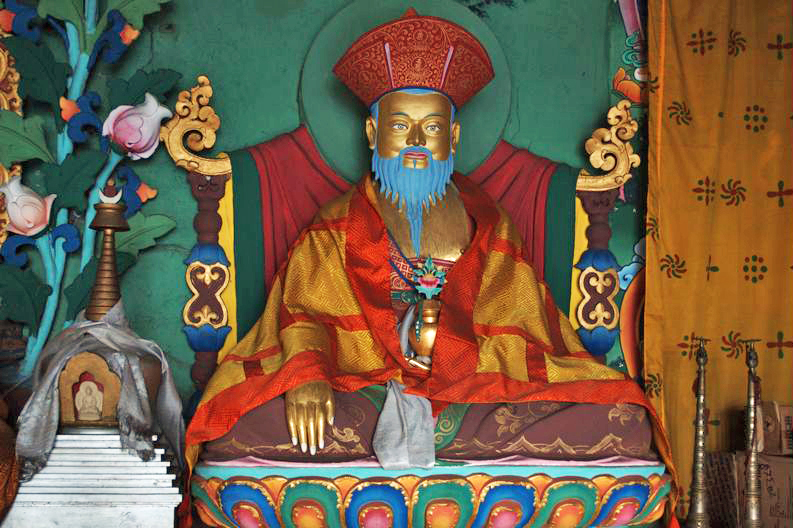 It is said that every household and temple in Bhutan has an image or statue of Zhabdrung Ngawang Namgyal, whose 4th mind emanation Jigme Norbu composed prayers to Dorje Shugden. So is it any wonder that the mind emanation of such a great being like Ngawang Namgyal, would encourage the propitiation of the Protector incarnation of a great being like Emperor Kangxi? You know what they say about birds of a feather flocking together. Anyway, seriously, go and check out the post. It is one of the most extensive pieces of research and writing ever done on Rinpoche’s blog, which is saying something because Rinpoche does extremely thorough and very rigorous research before publishing anything on the blog. After all, when the blog has been read by 10 million people, you don’t want to put out wrong or inaccurate information out there. And not only is the post extensive, but fascinating too. It’ll show you a side of Bhutan that extends beyond the hip AJ+ / In The Know / Great Big Story / VICE nano-reports we’ve all come to know (and some of us, love haha). And when you’re done, drop me a line and let me know what you think!